I’m going to start off by saying that yesterday’s day of eats was flat-out U.G.L.Y. I ain’t got no alibi, it’s ugly, yea yea it’s ugly. To begin with the series of unattractive food photos, we’ll begin at breakfast. 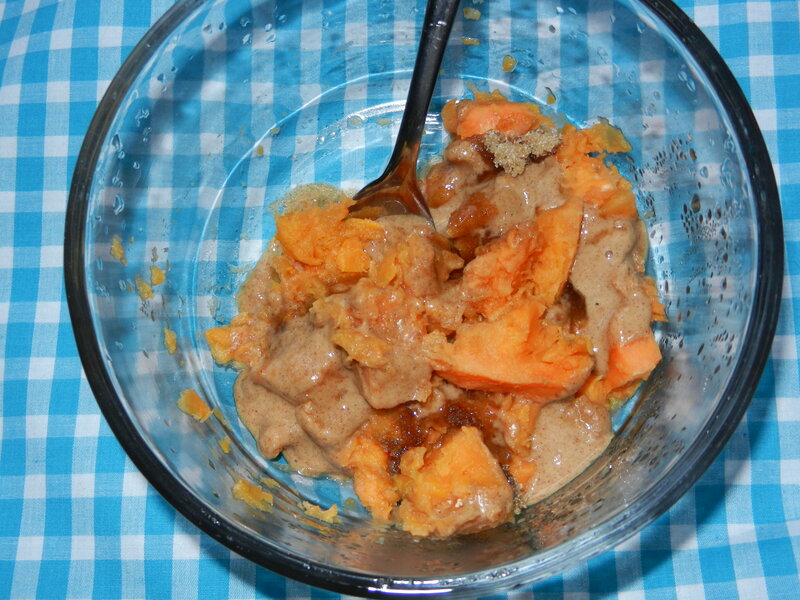 I decided to try something new for breakfast: sweet potato with peanut butter. I have been loving this combo for lunch so I figure hey why not try it in the morning? As much as I enjoy my boring old bowl of Cream of Wheat each morning, I thought it would be fun for all of us if I jazzed it up a bit. Enter: the ugliest food photo I think I have ever taken. The verdict? I don’t know if it was just the particular day that I wasn’t feeling this combo for breakfast, or if the texture was too much for me to handle in the morning, or what it was; all I know is that I wasn’t havin it. Not one bit. I ate a few bites before pitching it. That was me trying to eat outside the box in the morning. Outside the cereal box that is. Speaking of cereal box, on to breakfast #2. 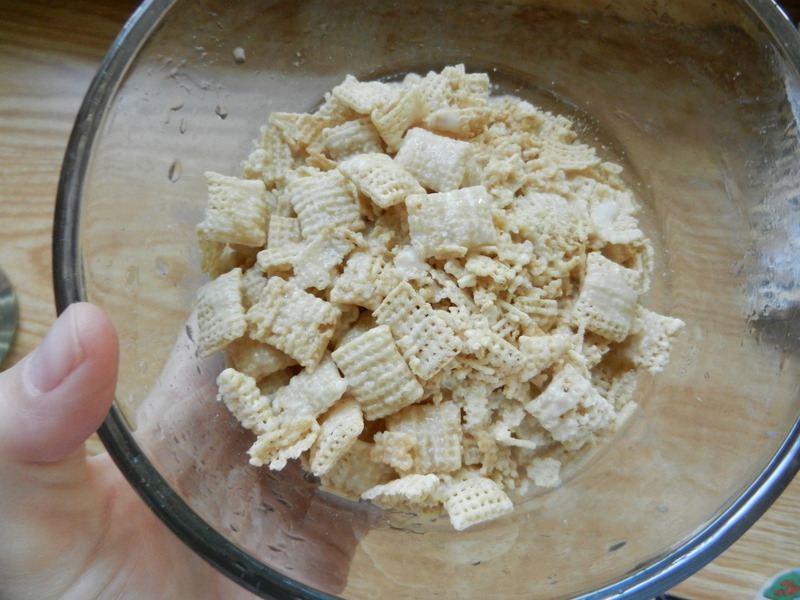 After my first failed breakfast attempt, I wasn’t feeling very motivated to get creative, plus I was running out of time before work, so I poured myself a bowl of Rice Chex with almond milk and a little sugar. Very boring but simple and tasty, and just what I wanted. I’m not giving up on the whole sweet potato in the morning bit just yet, but I will go another route next time; maybe puree them and add them into pancakes? We’ll see. I met up with my mama and miss Abbie for lunch yesterday for a picnic during my break. 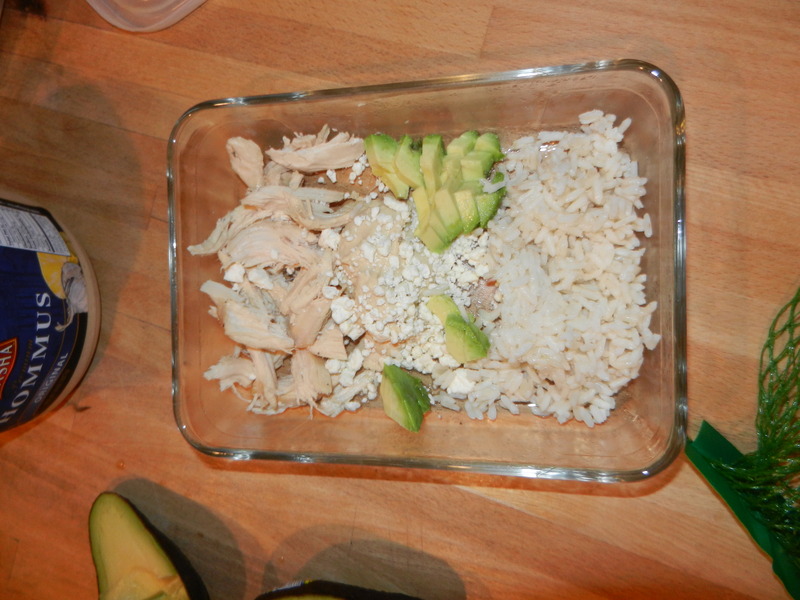 I packed a Greek inspired low-fiber dish consisting of white rice, chicken, hummus, feta, and avocado. I sprinkled the whole thing with lemon juice and a touch of salt. Absolutely delicious. I also ate a banana and some nummy Aussie licorice bites mom brought for dessert. I loved spending my lunch break with mom. We ate outside at a nearby park and enjoyed the sun and a cool breeze. I wish we could do that more often! I mentioned yesterday that I was wanting and needing to get back on the workout wagon. It’s been a little difficult for me lately since I haven’t been feeling very well due to the colitis, and I am finding that lower impact exercises like yoga, walking, and the elliptical are agreeing with me better than higher impact activities like long runs. If I do want to run, it has to be right away in the morning when I don’t have much food in my system yet, and this just hasn’t been happening lately. My body has been favoring sleep and I have really been trying to listen to my body. If that is what it needs right now to heal me faster, that is what it is going to get. I do want to keep moving and I will keep moving, I will just be switching up my activities a bit for now. With that being said, I headed to the gym after work. I started off with 20 minutes on the elliptical, followed by 10 minutes on the stair stepper, and finish off with 10 minutes walking at an incline on the treadmill. I didn’t have any new magazines to read so instead I watched The Real Housewives of Orange County. Some chick was getting married and it kept me entertained for the duration of the workouts. I finished off with my favorite core move on the bosou ball. I really need to get back on my game in the strength training department too. I so easily fall off the wagon on this one. I headed home to the boys and began contemplating dinner. 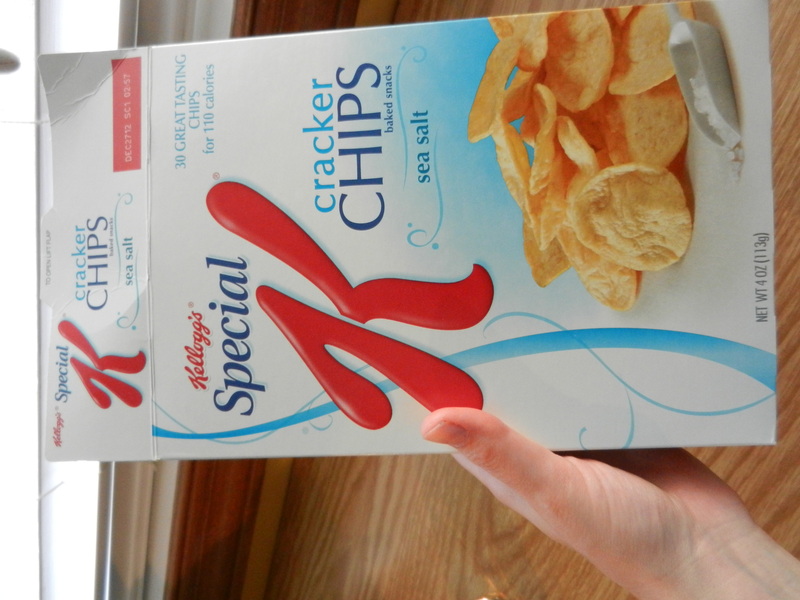 While I pondered, I snacked on Special K Sea Salt Cracker Chips with hummus. When planning meals, I often try and decide on the protein source first, and then build off of that. Last night our main protein source was going to be eggs. In a pan on the stove top, I sautéed diced mushrooms, added cooked spinach, and low-sodium deli turkey. In a separate bowl I whisked together two eggs and about 1/2 cup egg whites for Dana and I. Once the mix-ins were finished sautéeing, I poured the eggs onto the pan and began the scramble. During the last minute of cooking I sprinkled in about 1/4 cup of shredded cheddar cheese until it was gooey and melted into the eggs. I plated them up and sprinkled the dish with salt and pepper and a little squirt of ketchup and enjoyed a proton packed dinner that came together in just minutes. I told ya it was an ugly day of eats. I guess this one isn’t too bad. Besides my first shot at breakfast, the meals were all very tasty which goes to show that you can’t judge a book by it’s cover. I especially enjoyed our scrambled egg dinner. 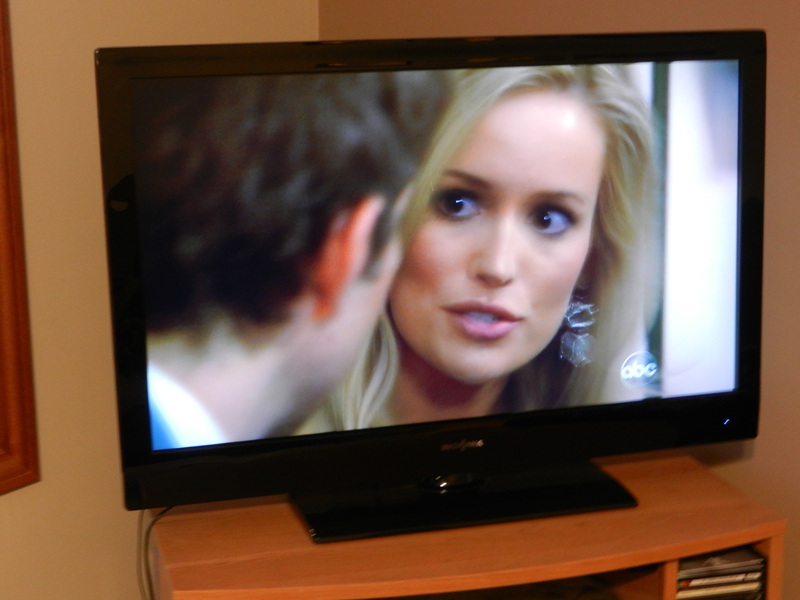 The rest of the evening was spent watching the drama unfold on the bachelorette. I loved that Emily told one of the guys off after finding out he was referring to her daughter as baggage and saying some other cruel things about her. What a jerk! He was a nasty one. I’m glad he’s gone. My favorite is still Sean; has been since the beginning. He is sweet, smart, kind, and very handsome. If it were up to me, Emily would choose him. Why do I get sucked in to watching this show every season? Why? 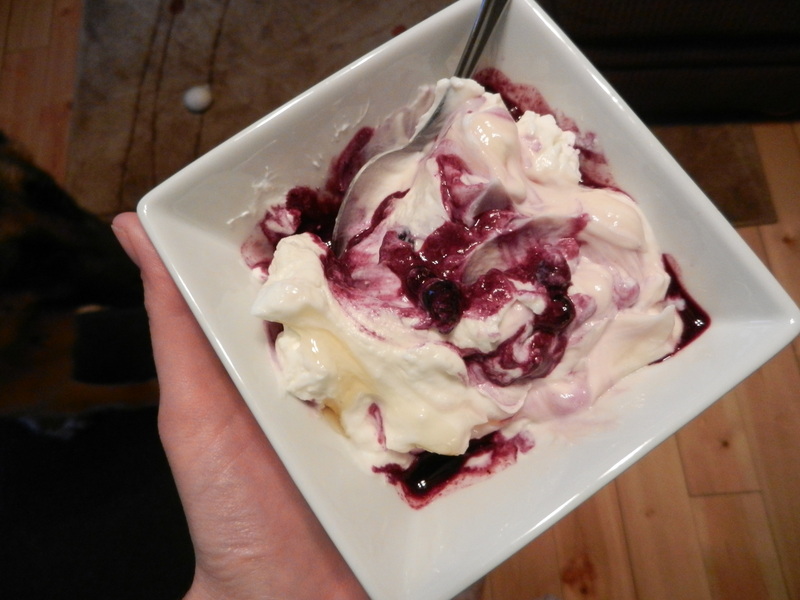 Later I needed a little snack so I made myself a small bowl of Fage Non-fat Greek yogurt with frozen blueberries and honey. I also stumbled upon two Milano cookie melts that I saved from an airplane snack during one of our last vacations. For being a packaged cookie, they were pretty darn good. I still prefer homemade of course. Off to get ready for the day! Peace and love. Question for you: Have you ever made a dish that turned out completely unappealing to the eye, but tasted awesome? Tell me about it! I would love to hear from you! 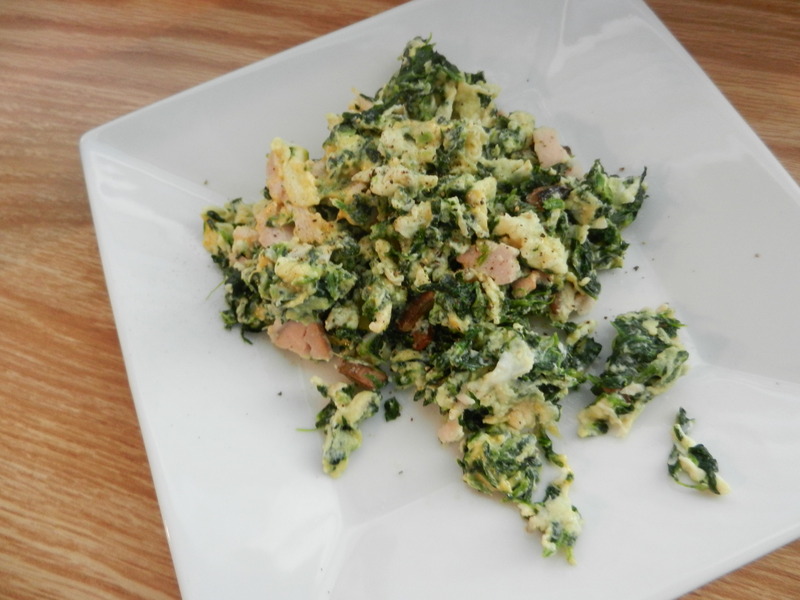 This entry was posted in Dinners, Family, Health, Lunch, Workouts and tagged Cereal, Eggs, FAGE, low-fiber, Veggies by Melanie. Bookmark the permalink.